VietPress USA (Jan. 8th, 2018): On Oct. 10th, 2017, the head of the Environmental Protection Agency, Scott Pruitt, has moved to officially repeal the Clean Power Plan. This was a rule President Obama had put in place to try to cut carbon emissions from coal-fired power plants. Pruitt had promised to eliminate the regulation for months. He says the EPA overstepped by setting standards that power plants could not reasonably meet. This is the decision announced by President Donald Trump to terminate the Obama-era of Clean Energy and return to the Coal plan. But today, AP reported that an independent energy agency on Monday rejected a Trump administration plan to bolster coal-fired and nuclear power plants, dealing a blow to President Donald Trump's efforts to boost the struggling coal industry. WASHINGTON (AP) — An independent energy agency on Monday rejected a Trump administration plan to bolster coal-fired and nuclear power plants, dealing a blow to President Donald Trump's efforts to boost the struggling coal industry. The decision by the Republican-controlled Federal Energy Regulatory Commission was unexpected and comes amid repeated promises by Trump to revive coal as the nation's top power source. The industry has been besieged by multiple bankruptcies and a steady loss of market share as natural gas and renewable energy flourish. The energy commission said in its decision that despite claims by the administration to the contrary, there's no evidence that any past or planned retirements of coal-fired power plants pose a threat to reliability of the nation's electric grid. Even so, the five-member commission said it will review the resilience of the nation's electric grid and requested information within 60 days from regional transmission organizations and independent system operators that oversee the grid. The panel said it expects to "promptly decide" whether additional action is needed. The Trump administration's plan, outlined last fall by Energy Secretary Rick Perry, was opposed by an unusual coalition of business and environmental groups that frequently disagree with each other. Dow Chemical, Koch Industries and U.S. Steel Corp. stood with environmentalists in opposing the plan to reward nuclear and coal-fired power plants for adding reliability to the nation's power grid. 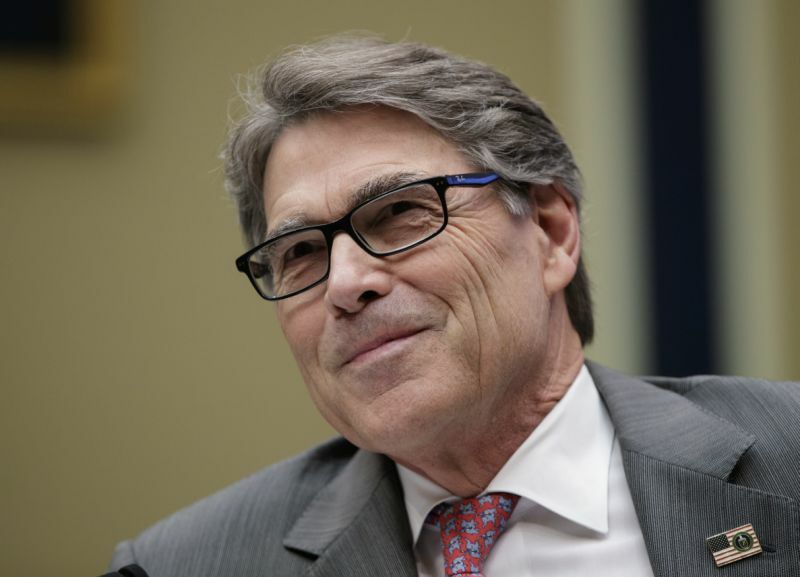 Perry thanked the energy panel Monday for addressing his proposal, which he said had initiated a national debate on the resiliency of the nation's electric system. "What is not debatable is that a diverse fuel supply, especially with onsite fuel capability, plays an essential role in providing Americans with reliable, resilient and affordable electricity, particularly in times of weather-related stress like we are seeing now," Perry said. Critics said the weakness of Perry's plan was shown by a recent cold snap that gripped the East Coast. Instead of plunging the eastern seaboard into cold darkness, the storm caused relatively few outages, including one that shut down a nuclear power plant in Massachusetts. "Rick Perry's scheme to prop up aging nuclear and dirty coal plants was never about making sure the lights and heat stayed on," said John Moore, an energy policy expert for the Natural Resources Defense Council. "It was about protecting the bank accounts of plant owners at the expense of everyday Americans." The exact cost of Perry's plan is unknown, but critics say it could have resulted in subsidies to coal and nuclear plants worth billions of dollars. Environmental groups said the administration's plan would boost dirty and dangerous fuels, while non-coal and nuclear energy providers warned about interference in the free market and manufacturers that use huge amounts of electricity complained about higher energy prices. Tech giant Apple weighed in Monday against the proposal, saying it would inhibit innovation and competition and interfere with plans to increase use of "clean energy" such as wind and solar power. In its decision, the five-member energy panel essentially agreed with critics who said there was no evidence of a threat to the grid's day-to-day reliability that would justify the action Perry was seeking. Perry's request to FERC came after he denied a coal industry request to issue an emergency order protecting coal-fired power plants that complained they were overburdened by environmental rules and market stresses. Trump committed to the measure in private conversations last summer with top coal executives. But the White House eventually agreed with Perry's decision to reject the proposed two-year moratorium on closures of coal-fired power plants — an action that would have been an unprecedented federal intervention in the nation's energy markets. Ohio-based Murray Energy Corp., the nation's largest privately owned coal company, had sought the order. CEO Robert Murray warned Trump that failing to act would cause thousands of coal miners to be laid off and threatened the viability of his largest customer, Ohio-based FirstEnergy Solutions. Murray Energy could not immediately be reached for comment Monday. Deputy Energy Secretary Dan Brouillette said in an interview that the department was encouraged by FERC's decision, noting that the panel has pledged to conduct its own review of grid resiliency. "They voted 5-0 to address resiliency. I think it's a very important first step," he said.